A beautiful but bitterly cold day which saw a slow start on the trains turn into an acceptable day for February. The weather forecast for the coming week is a slight concern, so lets hope its not too bad. Down the yard, the repaint on the Class 33 continued and Faraday had further needle gunning to the body. TSO 4440 had more welding on the frame work. Half term Thursday trains today which turned out to be basically equal with Sundays results. Quite admirable for the time of year to be fair! Down the shed, the SO was receiving attention to a door pillar to get that fit for this season and the repaint of the 33 continued, with it getting to the exciting stage now. Met-Camm 50253 had faulty drop light scissors replaced and also the Guards door removed, planed and then rehung as it was catching on the floor. The S&T Dept did some maintenance on the ground frames at Duffield to ready them for the Diesel Weekend. Our first scheduled Saturday service of the new season got off to a busy start with good visitor numbers. In fact visitor numbers were roughly double for the same time last year. We also held our second volunteer day which was very well attended and new volunteers expressing interest in all areas of our enterprise. Richard undertook a number of yard tours for our new recruits and it was good to see so many of our existing volunteer team attending to welcome our new members. Down the yard work continued on the Class 31 in preparation for our exciting diesel gala in a few weeks. Rob was busy undertaking a DMU 'A' exam and carriage restoration continues at a pace. A number of the steam team were also in attendance together with the Duke's restoration group undertaking a range of associated tasks. In the new Station Cafe members of the LMSCA could be found multi-tasking following the re-fit of the food counter area which has made a positive impact upon speeding up service and reducing queue sizes. Finally, our second book publication is nearing completion and the Author, Tim Oakes would appreciate any good quality photographs you may have of an Austerity or J94 working in Derbyshire. Cromford and High Peak photos are especially welcome. It almost felt spring like today with glorious sunshine ahead of the first day of the season tomorrow which is also Volunteering Day. Today was mainly preparation for tomorrow with the platforms at Wirksworth being tidied, swept and checked. Some of the display items for tomorrow were also gathered. Down the yard, the Bubblecar was having some investigative work done in to a slow crank issue and the Class 31 received further attention to the engine governor to rectify a divert issue which was identified during the test run last week. Finally a sunny day! This enabled a flurry of outdoor activity including washing down the green when has grown on to Gorsey Bank Crossing gates and the S&T team adjusting them to make them easier to use. The Bubblecar had a fuel point exam ready for the season with no apparent issues and the units were fuelled ahead of the start of the operating season. As I was trying to leave Henry Ellison was arriving back from the NYMR but a burst hydraulic hose on the trailer right in the station gate hole somewhat delayed proceedings for everyone. The final Saturday without trains. The weather was truly miserable so most people hid inside the Maintenance Facility and I don't blame them. The Class 33 repaint continued and work on EVRAs BSK also continued with work on the door pillars. The Duke team continued to play with their recently fitted boiler. A pair of fitters offered their services to the Bury Unit Team on the East Lancashire Railway to look at an electrical fault on the Class 110 DMU. We await their report back! Another cold day in the valley where there only a handful of people on site. Iris' pre season exam continued with the replacement of the vacuum exhauster belts which were life expired. Derek and Dan continued work on the BSK in the shed. That really is about it! A cold weekend with snow starting Saturday but it being bitterly cold thereafter. Once again, with no trains, it has been all about season preparation. The Class 33 repaint has progressed, as too has the coach examinations. 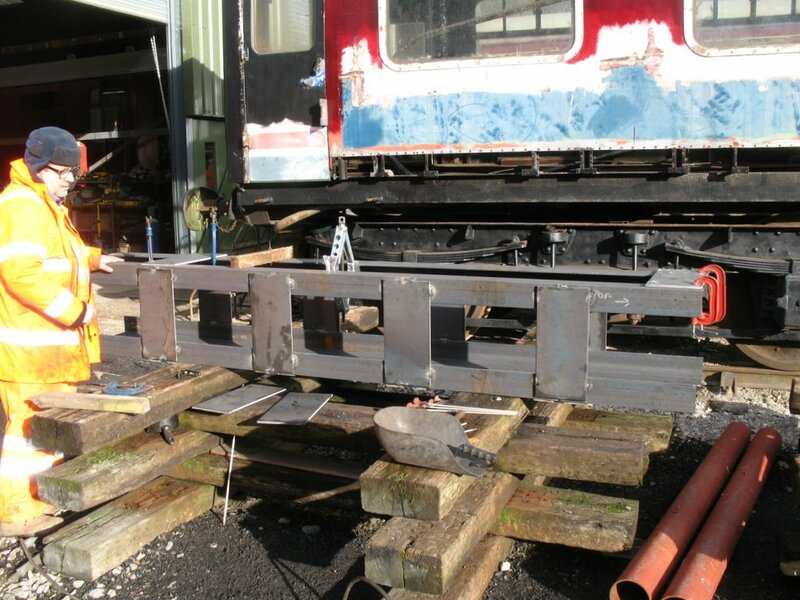 The Duke's bunker which was lifted on to the loco frames earlier in the week was fettled to ensure a good fit. The Buffet Car modifications, which are nearing completion, had the wiring completed so that the new equipment could be powered up. Hot pasties coming soon! Despite it being a cold day, there are a few signs of spring. It was a nice sunny day and it is certainly light later. There weren't many people on site today but there were a few pockets of progress. Wiring modifications following the alterations in the buffet were being carried out to enable the new equipment to be plugged in. Down the yard, the repaint of the Class 33 continued apace and, once the afternoon shift had arrived, work began on trying to rectify a fault with the Class 31's engine governor. The locomotive will go over the pit in a couple of weeks time for inspection ahead of the event in March. Finally dull January is done and we're on the countdown to services restarting. There were two main areas of progress today. 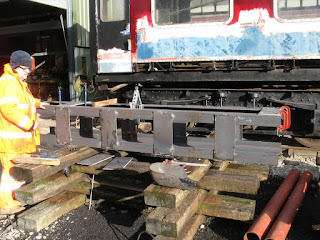 The first being the fitment of The Duke's bunker to the loco frames. This requires work but physically lifting it on is a major step forward and was a task in itself, requiring all the vehicles on that road both inside and outside of the Maintenance Facility to be shunted out of the way. The second area was with ths S&T Dept who started constructing a brand new bracket signal for the south end of Shottle loop. 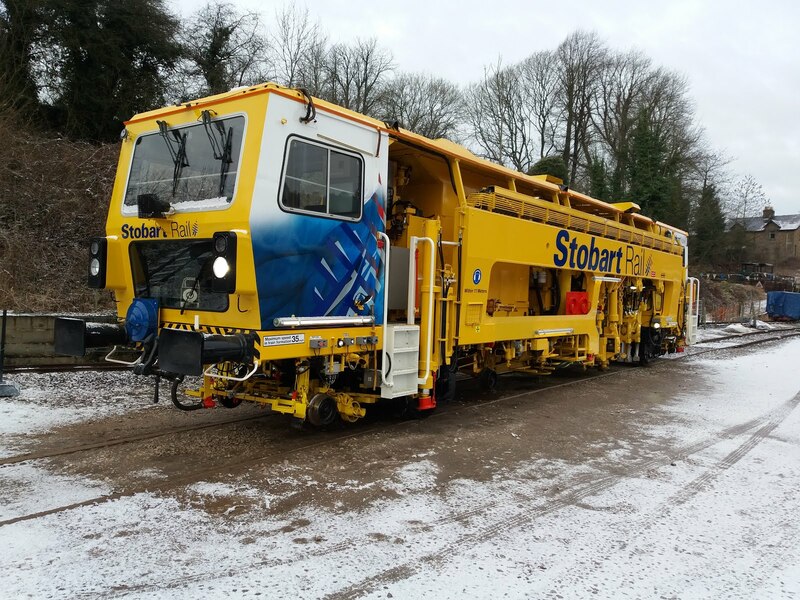 The tamper, which is on test, ran around the yard.